Troy Tulowitzki (12, at left) this week at Yankee Stadium. Photo by Jason Schott. On Thursday morning, the Yankees placed shortstop Troy Tulowitzki on the 10-day injured list with a left calf strain. Tulowitzki suffered the injury during Wednesday's game against Detroit, and he left after the third inning. 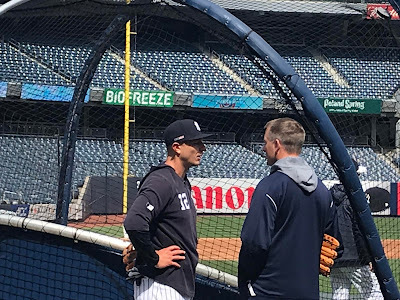 Yankees Manager Aaron Boone said afterwards that it was likely that Tulowitzki would go on the IL. 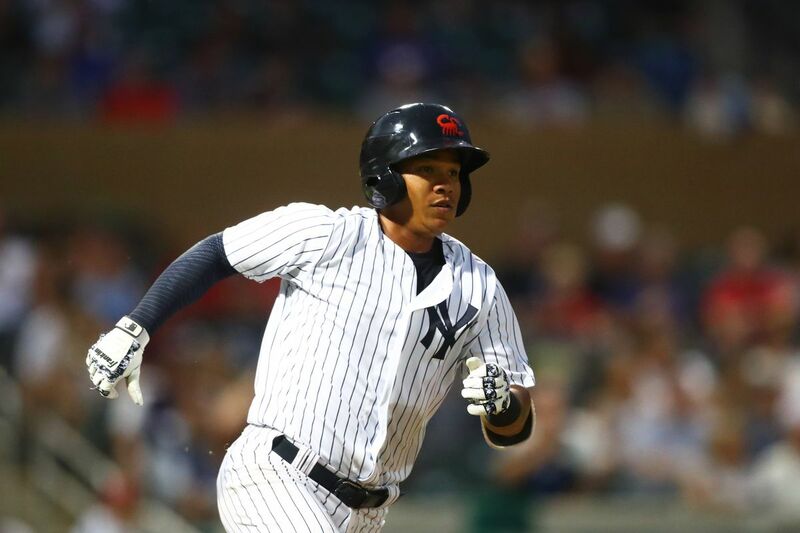 The Yankees called up INF Thairo Estrada from Triple-A Scranton/Wilkes-Barre. The 23-year old from Venezuela, was originally signed by the Yankees as a non-drafted free agent on August 2, 2012, will wear number 30. Estrada hit .286 (8-28) with 0 home runs, 2 RBI, 2 runs scored, 1 double, 4 walks, and 9 strikeouts in 17 spring training games. Boone said of Estrada on Wednesday night and what he thought of his spring, "Good, good, I mean, excited about, especially after last year, with missing as much time as he did (two stints on the minor league disabled list, 4/6-18 and 5/8-9/24), he's a guy that we feel like is going to be a good player and has made a lot of strides and did really good in the spring." Last season, Estrada was limited to 18 games last season with Single-A Tampa and Triple-A Scranton/Wilkes-Barre, combining to hit .192 (15-78) with 3 doubles, 8 RBI, and 5 runs scored. Following the season, he played for the Arizona Fall League's Glendale Desert Dogs, batting .238 (19-80), with 2 doubles, 7 RBI, and 9 runs scored in 19 games. Thairo Estrada in the Arizona Fall League. In 2017, Estrada spent the entire season with Double-A Trenton, batting .301 (149-for-495) with 6 home runs, 48 RBI, 72 runs scored, 19 doubles, and 4 triples in 122 games. At 21 years and two months, was the seventh-youngest player to make a 2017 Opening Day roster in the Eastern League. Estrada was named to the Eastern League Mid-Season and Postseason All-Star teams. In the 2017 Arizona Fall League, he played for Scottsdale and hit .342 (27-for-79), with 1 home run, 10 RBI, 13 runs scored, 2 doubles, and 1 triple. He was named to the league's Fall Stars Game and the AFL's 2017 Top Prospects Team. Baseball America named him the Yankees' No. 9 prospect following the season, and he was added to the Yankees' 40-man roster on November 20, 2017.